Ricky from Symbian-Guru.com recently got his hands on the Nokia E75 and put it side by side with the E71. It's amazing how the E75 is only slightly thicker than the E71, while the E71 is wider because of the landscape screen. You'll also notice that the slider on the E75 seems to be very solid, especially for being a pre-production model. Click here to watch the video and see Ricky's comments. Ani from S60 Blog has put together a very handy chart to see the features of the E75 and E71 side by side. Seems the E71 still holds it's own. Click here to see the chart. 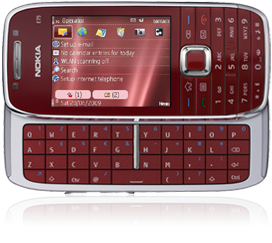 Lastly, a discussion has begun over at the E71 Fanatics Forums. Check it out here.